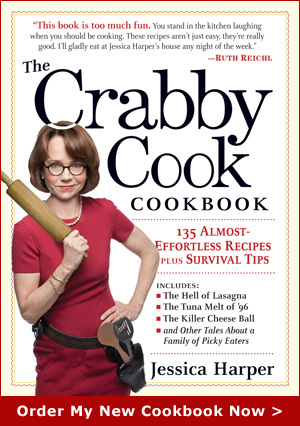 The Crabby Cook – Jessica Harper» Blog Archive » Ask The Crabby Cook! This entry was posted on Monday, January 17th, 2011 at 8:06 am	and is filed under Crabby Cook News, Videos. You can follow any responses to this entry through the RSS 2.0 feed. You can leave a response, or trackback from your own site. I just checked out your appearance schedule and it looks like you’ll be in Houston on Thursday 01/27/11 at 6:30p.m. at The Central Market Cooking School. Will you be teaching a cooking class, making one of your receipes, and/or autographing your cookbook? Hi Jessica: I have your book (your publisher sent it to me), and I can’t wait to read it. I see you’ll be in Boston in March. I’d love to attend your Boston Public Library event — I hope you’ll be cooking — and (if possible) carve out some time for an interview (I co-host a weekly radio podcast called Cooking with the Moms). Your videos are so funny. I could totally relate to your cranberry sauce / Thanksgiving episode. Thanks Liz! Just went to your site and I am SO making those fruitcake muffins! Hope to see you in Boston! You really live life to the fullest. Thnx for your dedication to Food Fun. Honey i know the answer!! Both are Yummy! !